Lost in Paris (2016) – Comedy drama by Dominique Abel and Fiona Gordon, 83 min., France, part-subtitles. Full of imaginative sight gags and physical comedy including a surprising and delightful tango—harkening back to great film comics like Tati and Chaplin—this charming story follows Fiona while she visits Paris for the first time to assist her myopic Aunt Martha. Catastrophes ensue, mainly involving Dom, a happy-go-lucky homeless man who has yet to have an emotion he was afraid of expressing. Preceded by the short "Little Dictator." Screenings on Friday, Nov. 3, at 6:30 p.m., and Tuesday, Nov. 7, also at 6:30 p.m.
Faces, Places (2017) – Documentary by Agnès Varda, 89 min., France, subtitles. When 89-year-old director Agnès Varda and young photographer/muralist J.R. met, they immediately wanted to work together to make a film in rural France. Traveling in J.R.'s photographic truck, they connected with strangers by listening to them, photographing them, and honoring them; however the real story is the growth of their unlikely but poignant friendship. Winner of the top documentary award at Cannes. Preceded by the short "Three Red Sweaters." Screenings on Friday, Nov. 3, at 8:30 p.m., and Sunday, Nov. 5, at 7:30 p.m. 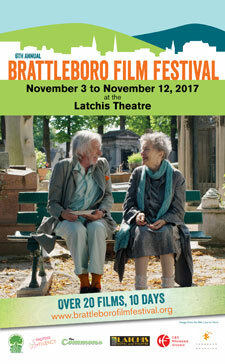 Check out the full lineup at www.brattleborofilmfestival.org.